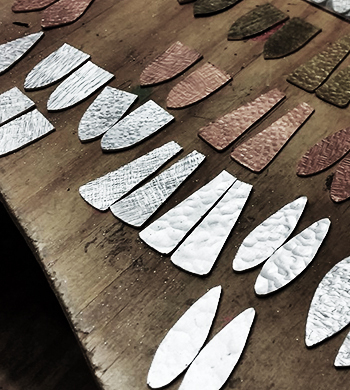 Under the guide of Silversmith Jemica Ostrofski, learn how to design and fabricate textured jewellery using recycled metals. The basic metalsmithing techniques of mark making will be explored using various hammers, letter stamps, number stamps and other tools. You will then have the opportunity to create your own unique design. This intro style workshop will run for 3 hours in which you will have the option of making – a pendent, earrings, cuff links, or brooch. This workshop hosts a maximum of 15 students, ensuring everyone gets the most out of a session. All necessary tools and materials will be provided on the day, however feel free to bring along any other found metals and see if they can be incorporated – napkin holders, cutlery, metal crockery etc. Meekz Contemporary Jewellery is the independent label of Queensland based silversmith Jemica Ostrofski. In 2009 Jemica graduated from the Queensland College of Art with a Bachelor of Fine Art with First Class Honours, after majoring in Gold and Silversmithing and gaining a passion for minimalist sculptural form. Adopting an ethically responsible and environmentally friendly practice, all Jemica’s collections are made using recycled, found and repurposed materials. Using traditional silversmithing techniques Jemica transforms the everyday into something unique and beautiful. Jemica runs workshops in metal texturing (mark making with metal), recycled wire weaving (our signature jewellery style of wire manipulation and weaving), riveting and hand sawing (traditional riveting and hand sawing skills), copper ring making (metal texturing and ring making techniques) and traditional ring making for two (traditional soldering techniques used in ring making).